ElephantDrive review, looking at their features, pricing, customer support and security measures, and examining the program's strengths and weaknesses. ElephantDrive boasts an impressive range of features, particularly for NAS users and those wanting to backup from multiple devices. You can read our detailed ElephantDrive review below or sign up now. ElephantDrive offer both free and paid subscriptions, with an option for business users as well. As of 2016, a new pricing plan has been implemented which, although in effect for new signups, has yet to be officially announced on ElephantDrive’s pricing page. Here at BestBackups, however, we’ve got early access to the info – so can confirm that users will now be able to get 1TB of storage space for just $9.95 per month – a huge improvement on their previous plan, which offered 100GB for the same price. If you decide to sign up, ElephantDrive accepts payment from most major credit cards, and yearly subscriptions can be purchased through PayPal. ElephantDrive was founded April 2005 by Ben Widhelm (now company Principal) and Michael Fisher (CEO). Both have considerable experience in providing technological services, with Widhelm contributing to application management product Burstly (which was later bought by Apple), and Fisher involved for several years with Vivendi Universal Net USA. Located in Santa Monica, California, the company has expanded significantly in recent years and now processes millions of files every day, as well as upholding partnerships with companies including QNAP, NETGEAR, and Thecus. 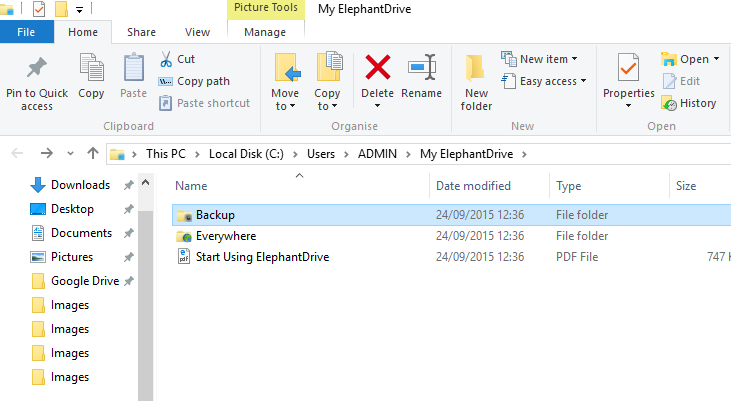 There are three ways to manually backup your files to ElephantDrive; right clicking on your chosen file or folder, using the desktop app, or via their website. There are also two locations that you can save your data to; ‘Backup’ and ‘Everywhere’. All data will be backed up to the Cloud, but while files placed in the Backup folder can only be accessed from the ElephantDrive website, those saved to Everywhere will be synced with all other devices registered to your account. If you prefer, you can also run continuous, automatic backups, or set a schedule for new uploads – although figuring out exactly how to do this can be a little time consuming. …then click “edit backup” and pick your preferred times and dates, or the frequency with which you want to process to run. When it comes to choosing which files to backup, there are no limits on file types, but individual file sizes are restricted. For Personal subscribers, no single file can exceed 1GB, while business accounts have a limit of 5GB. This is an important point to consider if you have very large files to backup – if it’s a deal breaker, then there are other providers on the market that give you much more freedom. ElephantDrive is compatible with Windows, Mac, iOS and Android. If you own multiple devices that run on different operating systems, that’s fine too. You can still backup and sync all of your files, even if half of them were created on a Mac and the other half on a laptop running Windows. Key to ElephantDrive’s philosophy is the view that users should be able to access their data from multiple devices without paying extra for the privilege. In a time when most people work from more than just one computer, this is a real advantage – especially as many other backup providers don’t offer the service or charge extra to register more devices. If you want to sync your files across multiple devices or share them with others, you’ll need to save them in ElephantDrive’s Everywhere folder. When you place a file in the folder, it will automatically appear in the Everywhere folder of all other devices registered to your account. Once in the Everywhere folder, it’s easy to share your files from the ElephantDrive website. All you need to do is log in, find the file you want to send and select ‘Share’ from its options menu. This will generate a link, which you can copy and paste in any location or email directly from the website to your desired recipient. ElephantDrive, like competitors including SpiderOak and Memopal, offers unlimited file versioning. This means that files synced to ElephantDrive will not only exist in their most up-to-date form – you’ll be able to access previous versions of them as well. It’s a very useful tool should you need to return to an earlier draft of a piece of work to retrieve deleted information or undo any changes. Most backup providers offer some form of versioning service, although many limit how many versions can be saved, or how long they are retained for. While ElephantDrive doesn’t impose any such restrictions, it does give you the option to put them in place yourself, as versions can take up valuable storage space. You can change your versioning rules from their website, as well deleting versions that you’re confident that you won’t be needing again. In addition to versioning, ElephantDrive also archives your saved files, so that when you delete data from your hard drive, it won’t be removed from the Cloud – your backed up copies will remain intact. If you’ve ever deleted an important document by mistake, you’ll understand just how helpful this service can be. You can customize your archiving rules, too – determining how long archived files are kept for, and deleting any that you don’t want or need to keep. Upload and download speeds are a significant part of the performance of every backup service, so we ran some tests on ElephantDrive to get an idea of just how quick it is. We did this by first uploading five files and manually recording how long they took to upload, then dividing the number of MB in each file by how many seconds it took to transfer. We then converted this number into Mbps and repeated the process on five downloads. You can take a look at our results below. As you can see, there’s not an especially big difference between upload and download speeds, with a 100MB file uploading in just over five minutes and downloading in a little under four. Our upload tests resulted in an average speed of 2.6 Mbps, similar to that of many other providers – the majority of which sit between 2 and 4 Mbps. Download speeds, on the other hand, averaged at just 3.2 Mbps, noticeably slower than many of their competitors, most of whom recorded figures between 4 and 5 Mbps. 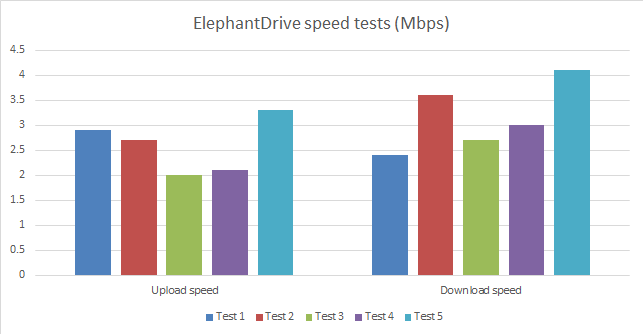 While our tests are designed to give a basic idea of what you can expect from transferring files using ElephantDrive, it’s worth noting that speeds do fluctuate depending on your broadband speed and other external factors, so our results should be taken as a guide only. One of ElephantDrive’s greatest successes is its compatibility with Network Attached Storage (NAS) devices. The company’s development in thi area has led to partnerships with major manufacturers of NAS hardware including NETGEAR, QNAP, Thecus, ReadyNAS and TurboNAS. While you can add files and folders from any NAS device, these companies have integrated ElephantDrive’s backup software into their product, making it particularly easy to use. As this compatibility is not widely developed by other backup providers, it makes ElephantDrive an excellent choice for NAS users. When it comes to protecting your data, ElephantDrive is pretty thorough, with industry-standard encryption and physical security measures in place. All data backed up to ElephantDrive is encrypted on your computer using a 256-bit AES key, and sent via a 128-bit SSL channel – the same standard of protection used by banks to keep online transactions private and secure. For an extra layer of security, you can also choose to encrypt your data using a privatel key based on a password. This is a powerful means of keeping your files private, as the password is never known or stored by the company in its plaintext (unencrypted) form – unlike if you use their standard key. Personal keys have a lot of security advantages, but they also carry a risk. If you were to forget or lose your password, you would have no way of signing into your account, and your data would be permanently inaccessible. ElephantDrive creates a new password for you if this happens (so that you can continue to use the service without paying for a new account), but it wouldn’t allow you to access any files saved using your private key. You’d have to start your backup all over again. On a physical level, ElephantDrive’s data storage infrastructure is provided by Amazon Web Services. All data is stored across multiple devices in diverse geographical locations both inside and outside the US to ensure that, should one data center suffer any physical damage, your files will still be safe on another. There are plenty of security measures in place inside the data centers as well, protecting servers against extreme temperatures, power failure, and natural disasters. Staff access is also restricted, with all personnel entering the building subjected to high-level authorisation checks. Responsibilities are divided up so that employees managing users’ data are not given tasks that require interaction with encryption keys. All ElephantDrive customers have access to an online FAQ and video tutorials, and Lite subscribers can make use of their email-based support ticket system, while Personal users can also utilize a live chat. While ElephantDrive’s online resources are useful for beginners, their frequently asked questions and tutorials cover a limited range of topics, and more advanced troubleshooting resources are mostly absent. On the plus side, there is a lot of information available for NAS users, so those choosing ElephantDrive for its NAS compatibility will find plenty of useful information on making the software work for them. Having sent an inquiry via support ticket, we received a reply in a little over eight hours. While this is fairly slow compared to some providers such as Memopal and Backblaze, who got back to us in less than half that time, we did receive an apologetic email informing us of the delay. It was a thoughtful touch and our reply, when it came, was clear and gave a detailed answer to our question as well as inviting us to respond should we have any further queries. ElephantDrive has an unusually limited social media profile compared to many of their competitors. While they maintain a blog as well as Facebook and Twitter accounts, none is updated more than a few times per month, and feature very little interaction with users. This is particularly noticeable on Twitter, where they have under a thousand followers, compared to the five to ten thousand that is typical of most other major backup providers. Downloading ElephantDrive is just a matter of visiting their website and choosing which plan you want to go for. If you opt for the Personal subscription, you’ll need to enter your payment details – if you’re happy with a Free account, you can proceed straight to downloading the 35MB installation file. While installing the program was perfectly straightforward, getting started can be a little confusing as ElephantDrive’s functions are split between the desktop application and their website. With limited instructions provided, it can take a little while to familiarize yourself with all of the available features, and the interface is not particularly intuitive so poses a few challenges. There are also confusing extras, like having to download the ElephantDrive Transfer Manager in order to upload and download files from the website – a somewhat clunky piece of software that we weren’t convinced was really necessary. If you get stuck, however, there are tutorials and instructions available on their Support website. With three different ways to backup your files, you can choose which option works best for you. The ElephantDrive desktop app works in much the same way as Google Drive and Dropbox – all you need to do to upload your files is drag or copy them into the ElephantDrive folder. Right clicking on a folder will also give you the option to back it up, although this does not work for individual files. You can also backup files by logging into your account on the website and clicking on the upload icon, which will launch the ElephantDrive Transfer Manager. You’ll need to install this if you want to upload or download any files, but be aware that it has compatibility issues with some browsers, such as Chrome, which require configuration in order to run the software. All three methods work a little differently, uploading files to slightly different locations in subtly different ways, which can be somewhat confusing. Once you’ve accustomed yourself to the processes you’ll be okay, but it feels unnecessary that something made simple by the majority of other providers is so complicated here. For iTunes and Android Store users, downloading the ElephantDrive mobile app is simple. If you purchase applications through Google Play, however, you’ll have more trouble. With the app not currently listed in their store, you’ll have install it directly from the ElephantDrive website, which doesn’t yet have a mobile-friendly version. Once you’ve got the app up and running, it’s considerably easier to find your way around than the website or desktop app, with clear settings and upload options. Opening folders and viewing files is very time-consuming, however, and the app crashes frequently, so beware. In addition to this, making your files available offline is only possible if you’re using iOS – Android users can currently only open and view their data, although an update is currently in development. We found this pretty disappointing given ElephantDrive’s much-lauded file syncing options; with the majority of providers offering full access to files from mobile devices, we expected more. ElephantDrive’s greatest achievement is its successful integration of NAS, so if you’re looking for an NAS-compatible program, it’s an excellent choice. For other users, features such as file versioning have been very well developed, and the ability to backup multiple devices without paying extra is a major bonus. On the downside, their website and software are not particularly user-friendly, although we think new pricing plans make it well worth taking a little time and effort to learn how to make ElephantDrive work for you. What do you think of ElephantDrive? Leave your thoughts in a comment. It was pre-installed on the NAS (mine is made by Western Digital) and was pretty simple to set up. Solid solution and very affordable (lower pricing than what is shown above – not sure if that is old or there is some deal with WD). Hi Maxwell, thanks very much for your comment – we’re glad to hear you’re enjoying ElephantDrive! I’ve double checked their current price plans, and can confirm that the prices in the review are still up to date – perhaps you were charged the discounted yearly fee, or were part of a localised promotion. I hope you continue to find the service useful – keep us updated if you learn anything new!